Edited by kubikyuu, 05 May 2017 - 02:52 AM. CM Astra does this mean classic is currently getting EXP/DROP boost at the moment? i realy, realy, REALY, don't think iRO have 7.142 REAL persons who play. 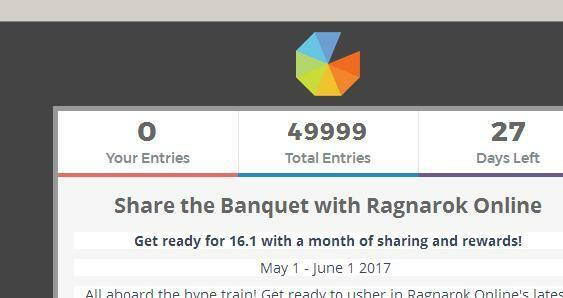 Taking this in count, i don't think we could reach 50k, even on 1 year period. This taking that everyone would get 7 entries. If not everyonee get 7 entries, we would need even more people. Edited by Ethanasael, 05 May 2017 - 09:44 AM. If your dreams give people false hopes: yeah. Any ETA on when Sakray will be open to public testing for 16.1? Edited by KriticalAssassin, 05 May 2017 - 11:07 AM. Attention everyone! We've added 2 more ways to gain entries - view a Facebook post and retweet a link! Check back to the Event Page to get those entries in! Just kidding I definitely added more than 2 ways to enter, and some of them are daily entries! I can't seem to complete the new entry options. It always sends back, "Sorry, you're creating too many entries. try again later." Were do we get that? Nah. False or not it's stil a hope. ...and CMAstra updated ways to gain entries so it's not a dream anymore. And it'll be a dream until it becomes reality. So it's 6558 and counting. How do we get our rare pet tame grab bag? NOW WE CAN DO +1 EVERYDAY, YOU'RE THE BEST ASTRA! +2 everyday hype! someone should make a thread on the main page. If even 200 people faithfully do the daily +2...... we can make another bracket happen! ayyy! so where is the npc ? how can i share this? i already register in facebook.